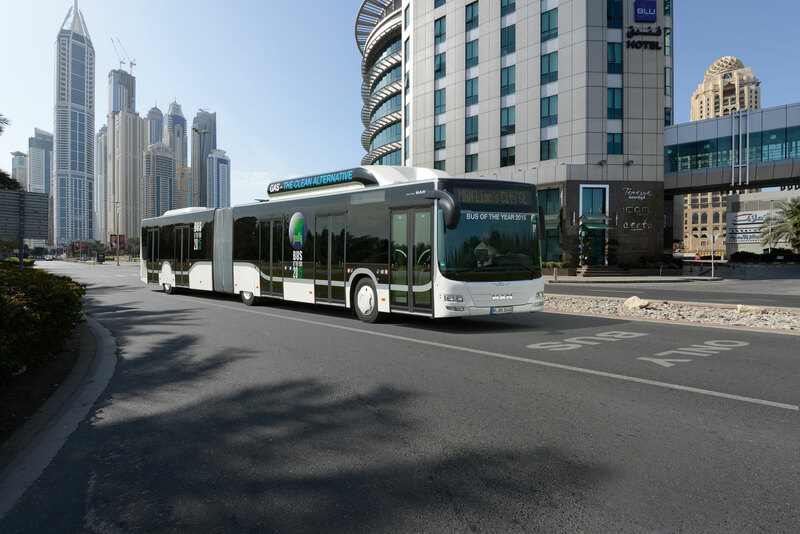 MAN Truck & Bus today announced that the Roads and Transport Authority, Dubai have decided to launch the trial of a MAN CNG (Compressed Natural Gas) bus in a move aimed at studying the feasibility of such buses and as part of the RTA’s larger goal of fostering environmental sustainability and reducing its carbon footprint. The RTA will be using the MAN Lion City CNG bus which was awarded the 'Bus of the Year 2015' at the IAA Commercial Vehicles Fair in Hanover, Germany. The trial operation will continue for 12 months during which the bus will be operating on a public bus route. It will be operating over 400 km without requiring gas refuelling and specialist engineers of Public Transport Agency will monitor the operational performance in addition to assessing the efficiency of the bus under various operational conditions. The CNG engine of the MAN Lion's City bus offers an environmentally friendly public transport mobility solution with extremely low pollutant levels. When filled up with biogas or e-gas, the bus is virtually carbon neutral and offers emission levels comparable to that of fully electric vehicles. Even without the use of biogas, CO2 emissions are reduced by approximately 17 per cent in comparison to diesel vehicles. As well as being a sustainable fuel source, natural gas is also a particularly economical solution. Due to the significantly reduced fuel costs, over a period of ten years a MAN Lion's City CNG bus saves approximately 15 per cent on the life cycle costs in comparison to a diesel bus from the same model range. The MAN Lion’s City CNG Bus – based on 100% CNG technology especially developed for very hot regions – is a twelve-metre long low-floor solo bus, driven by a turbocharged six-cylinder engine powered by natural gas. The engine delivers 228 kW (310 hp) while its emissions are well below the limits set for Enhanced Environmentally-friendly Vehicles (EEV), currently the most stringent emission standard. The engine's exhaust gases are especially low in nitrogen oxides (NOx) and particulates. In addition, a automatic gearbox equipped with a retarder detects up- and downhill gradients, automatically adjusting the gearshift points as it does so, thus helping to reduce fuel consumption. An additional benefit for the environment is the perceptible reduced noise emission with only 74db as compared to 78 dB of a diesel bus. An optional safety feature is the electronical stability program (ESP) to prevent the bus from flipping in extreme situations.